So other than posting the weekly episode of “Turn the World Around”, and noting that I’m not spending an awful lot of time writing lately, I haven’t really mentioned much about my own writing or publishing for a while. This post will correct that a little bit. 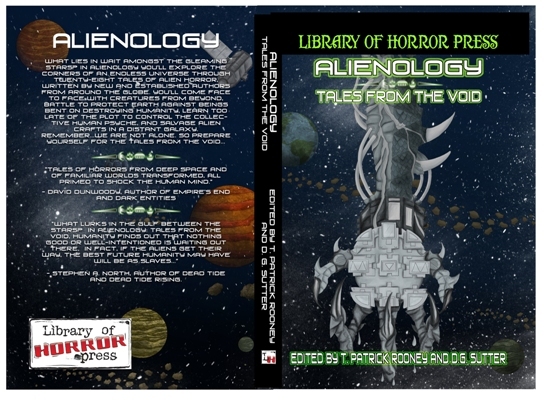 First, Alienology: Tales From the Void has just released from the Library of Horror. I have a story in this volume (as do a bunch of other great writers), entitled “Common Ground”. This anthology is a collection of SF-Horror stories that I’m both surprised and thrilled to be included in, and I can’t wait to put my hands on my copy and dive into the darkness. Here’s the cover, and it links to a larger size picture if you’re curious. Available at Amazon.com and Amazon.ca. The 20 minutes each day I’m allowing myself right now (typically on one break at work) for my own writing is typically netting me about 500 words, which I’m thrilled with. Half that level will be acceptable, but my fingers seem to have minds of their own at the keyboard for that 20 minutes and things are working pretty well. It might also be helping that the novel project I’m working on (the three inter-linked novellas), was more or less completely plotted in advance, something I’ve only done once before (for NaNoWriMo. Yes, I’m making adjustments and adding or subtracting things as makes sense to the story. It’s tentatively titled Shattered Dice, by the way, and is a military SF first contact story (sort of). If I manage to maintain the current pace, the first draft could be finished as early as the end of July, which would be cool. I know the novel I want to write after that, too, a semi-post-apocalyptic alien invasion YA story, with the unlikely title of Tashiik Dreams. I’ve also just had an acceptance at Golden Visions Magazine, which will be very kindly publishing “Dragonomics” in their Winter print issue this year. A couple of other announcements in this vein may be forthcoming as well, keeping my fingers crossed, but if I want too many more, I’m going to have to find time to get the submissions rolling again as I haven’t sent out too many stories this year so far. “Dragonomics” makes 20 acceptances, though, and that makes me pretty happy.